…or, how to draw an elephant in the room without making a fuss. 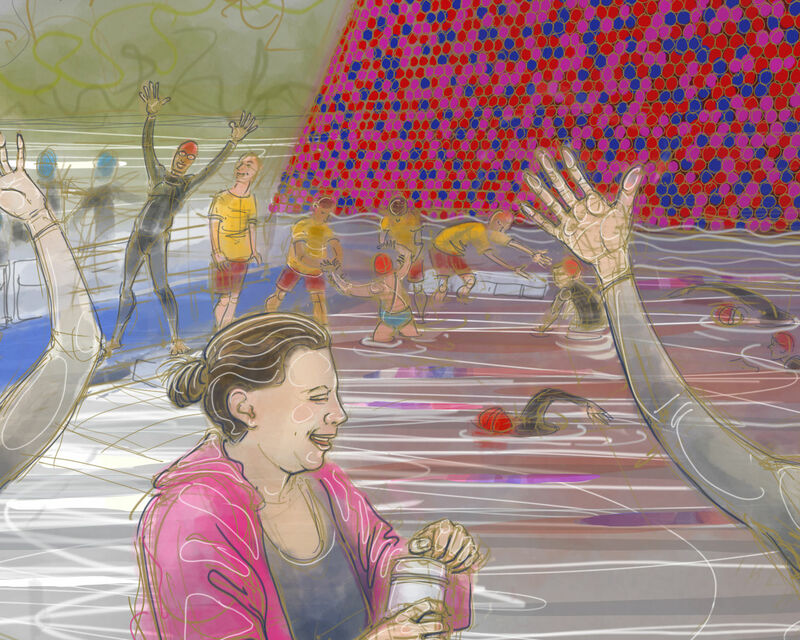 It loomed: vastly, hugely, enormously: The 20 metre high, monster sculpture of 7000+ barrels, painted bright pink, red and blue, (in case a 20 metre high floating sculpture wasn’t already sufficiently visible already in the middle of the Serpentine). The work of artist Christo was precisely what I had not come here to depict. 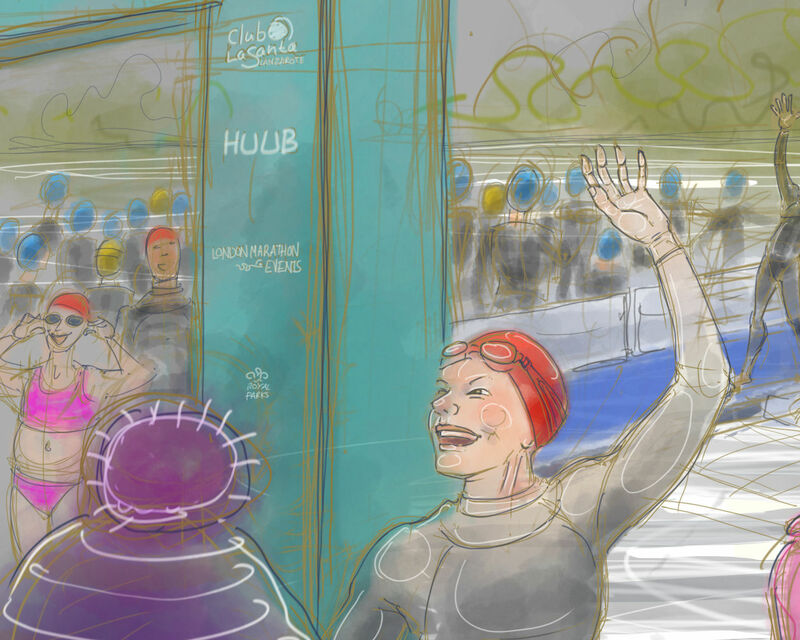 The Swim Serpentine event was a lovely bunch of swimmers – nearly as many as the barrels – swimming their way around the Serpentine in Hyde Park, London, supported by a very hard working group of organizers, volunteers, lifeguards… that is what I had come to draw. The swimmers are centre stage but if you peer behind them you can see the yellow T-shirted lifeguards on hand to assist wobbly swimmers getting out. They were much appreciated. And I have to hand it to the sculpture, it marks this event as this location, in this year. It drizzled for the afternoon so I battled the sculpture with a big yellow imaginary umbrella. I think the umbrella won. Useful things, umbrellas, especially imaginary ones. 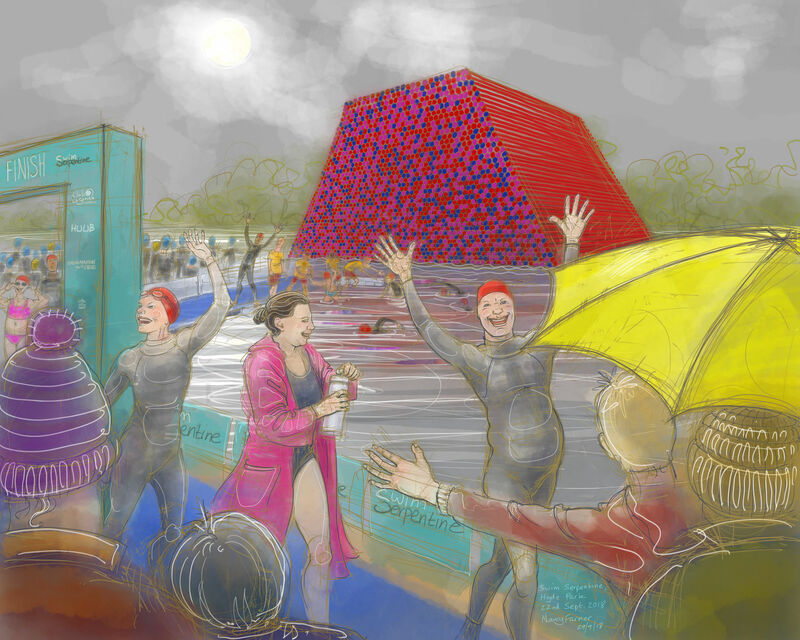 This entry was posted in digital, Events, swimming and tagged art, Hyde Park, open water swimming, Swim Serpentine 2018, Swim Serpentine Festival, swimming on September 30, 2018 by Nancy Farmer.